شباهنگ, رضا, سلطانی شال, رضا, نیکوگفتار, منصوره, حکیم جوادی, منصور. (1396). اثربخشی القای زیرآستانه جلوه‌های هیجانی چهره بر خلق. پژوهش های روانشناسی اجتماعی, 7(27), 35-48. رضا شباهنگ; رضا سلطانی شال; منصوره نیکوگفتار; منصور حکیم جوادی. "اثربخشی القای زیرآستانه جلوه‌های هیجانی چهره بر خلق". پژوهش های روانشناسی اجتماعی, 7, 27, 1396, 35-48. شباهنگ, رضا, سلطانی شال, رضا, نیکوگفتار, منصوره, حکیم جوادی, منصور. (1396). 'اثربخشی القای زیرآستانه جلوه‌های هیجانی چهره بر خلق', پژوهش های روانشناسی اجتماعی, 7(27), pp. 35-48. شباهنگ, رضا, سلطانی شال, رضا, نیکوگفتار, منصوره, حکیم جوادی, منصور. اثربخشی القای زیرآستانه جلوه‌های هیجانی چهره بر خلق. پژوهش های روانشناسی اجتماعی, 1396; 7(27): 35-48.
: القای هیجان، در غیاب آگاهیِ هشیارانه، از محرک­های فراخوان آن هیجان­ها، موضوعی بوده است که علاقه بسیاری را به خود جلب نموده است. پردازش­های هیجانی، بدون آگاهی هشیارانه، نقش مهمی در تعاملات اجتماعی بشر بازی می­کنند. لذا، این مطالعه، با هدف تعیین تأثیر القای زیرآستانه جلوه­های هیجانی چهره بر خُلق، انجام شد. روش: در این مطالعه­ی نیمه تجربی که روی دانشجویان دانشگاه گیلان انجام شد پس از جلب رضایت مشارکت­کنندگان و تکمیل پرسش­نامه دموگرافیگ و مقیاس خلق مثبت و منفی، افراد به صورت تصادفی به سه گروه مداخله (15 نفر) تقسیم شدند و در سه گروه مداخله القای زیرآستانه جلوه­های هیجانی چهره بر خلق، صورت گرفت. یافته­ها: نتایج نشان­دهنده تایید فرضیه­های پژوهش بود. چهره­های زیرآستانه­ای شاد، خلق منفی را کاهش و خلق مثبت را افزایش می­دهند، همچنین چهره­های زیرآستانه­ای غمگین، خلق منفی را افزایش و خلق مثبت را کاهش می­دهند. نتیجه­گیری: ادراک زیرآستانه­ای چهره­ها، در خلق جاری افراد در آزمایشگاه تأثیرگذار است، لذا می­توان از نتایج این پژوهش در زمینه­های درمانی و بالینی اختلالات خلقی در دانشجویان استفاده کرد. : The induction of emotion in the absence of conscious awareness of the stimulus evoking such emotion has long been a subject of great interest. Emotional processing without conscious awareness plays an important role in human social interactions. Method: The present study was conducted to determine the effect of subliminal presentation of emotional faces on mood. Students of Guilan University participated in this quasi-experimental study. Students completed demographic questionnaire, and questionnaire of Negative and positive Affect Scale. Then they were randomly assigned to three intervention groups (n=8). In the intervention groups subliminal presentation of emotional faces were carried out. Findings: Results showed that subliminally presented happy faces decreased negative mood and increased positive mood. The opposite effect was observed for subliminally presented sad faces. Conclusion: It can be concluded that subliminal perception of faces may be effective in experimentally induced mood change and therefore these results may be used by practitioners and clinicians to treat mood disorders in students. - بخشی­پور، ع. و دژکام، م. (1383). تحلیل­عاملی تأییدی مقیاس عاطفه مثبت و منفی. مجله روان­شناسی، 360، 9(4)، 365-351. - حسنی، ج. 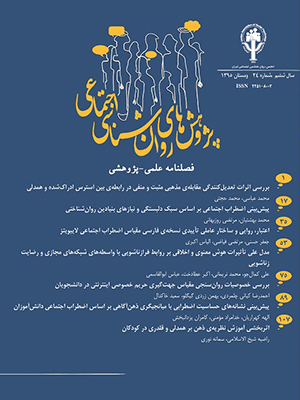 و امیری، س. (1394). عملکرد در قضاوت اخلاقی شخصی و غیرشخصی بر اساس ابعاد تجارب هیجانی زیرآستانه­ای مثبت و منفی. دوفصلنامه شناخت اجتماعی، 4(2)، 61-48. - دوستکام، م.، پورحیدری، س.، حیدری، م. و شهیدی، ش. (1389). القای خلق با استفاده از چهره­های هیجانی زیرآستانه­ای. فصلنامه روان­شناسی کاربردی، 4(2)، 19-7. - سلطانی­زاده، م.، ملک­پور، م. و نشاط­دوست، ح. ط. (1385). رابطه لذت جسمانی و عاطفه مثبت و منفی در دانشجویان دانشگاه اصفهان. مطالعات روان­شناختی، 4(1)، 46-31. - Berridge, K. C. & Winkielman, P. (2003). What is an unconscious emotion? (The case for unconscious liking). Cognition and Emotion, 17(2), 181-211. - Blair, R. J. R. (2003). Facial expressions, their communicatory functions and neuro-cognitive substrates. The Royal Society, 358, 561-572. - Blanchfield, A., Hardy, J. & Marcora, S. (2014). Non-conscious visual cues related to affect and action alter perception of effort and endurance performance. Frontier in Human Neuroscience, 8, 1-16. - Bornstien, R. F., Leone, D. R. & Galley, D. J. (1987). The Generalizability of Subliminal Mere Exposure Effects: Influence of Stimuli Perceived Without Awareness on Social Behavior. Journal of Personality and Social Psychology, 53(6), 1070-1079. - Breiter, H. C., Etcoff, N. L., Whalen, P. J., Kennedy, W. A., Rauch, S. L., Buckner, R. L., Strauss, M. M., Hyman, S. E. & Rosen, B. R. (1996). Response and Habituation of the Human Amygdala during Visual Processing of Facial Expression. Neuron, 17, 875-887. - Egermann, H., Kopiez, R. & Reuter, C. (2006). Is there an effect of subliminal messages in music on choice behavior?. Journal of Articles in Support of the Null Hypothesis, 4(2), 29-46. - Fitzsimons, G. M., Chartrand, T. L. & Fitzsimons, G. J. (2006). Automatic Effects of Brand Exposure on Motivated Behavior: How Apple Makes You “Think Different”. JOURNAL OF CONSUMER RESEARCH, 35, 21-35. - Hassin, R. P. (2013). Yes It Can: On the Functional Abilities of the Human Unconscious. Perspectives on Psychological Science, 8(2), 195-207. - Karremans, J. C., Stroebe, W. & Claus, J. (2006). Beyond Vicary’s fantasies: The impact of subliminal priming and brand choice. Journal of Experimental Social Psychology, 42(2006), 792-798. - Kiss, M. & Eimer, M. (2008). ERPs reveal subliminal processing of fearful faces. Psychophysiology, 45(2008), 318-326. - Krosnick, J. A., Jussim, L. J. & Lynn, A. R. (1992). Subliminal conditioning of attitudes. Society for Personality and Social Psychology, 18(2), 152-162. - Legal, J., Chappe, J., Coiffard, V. & Villard-Forest, A. (2012). Don't you know that you want to trust me? Subliminal goal priming and persuasion. Journal of Experimental Social Psychology, 48(2012), 358-360. - Lundqvist, D., Flykt, A. & Öhman, A. (1998). The Karolinska Directed Emotional Faces - KDEF, CD ROM from Department of Clinical Neuroscience, Psychology section, Karolinska Institutet, ISBN 91-630-7164-9. - Morris, J. S., Frith, C. D., Perrett, D. I., Rowland, D., Young, A. W., Calder, A. J. & Dolan, R. J. (1996). A differential neural response in the human amygdala to fearful and happy facial expressions. Nature, 383, 812-815. - Murphy, S, T. & Zajonc, R. B. (1993). Affect, Cognition, and Awareness: Affective Priming With Optimal and Suboptimal Stimulus Exposures. Journal of Personality and Social Psychology, 64(5), 723-739. - Roxana, R., Richard, S., Charles, C. & Rodney, W. (1987). Influence of subliminal visual images on the experience of anxiety. Personality and Social Psychology Bulletin, 13(3), 399-410. - Ruch, S., Zust, M. A. & Henke, K. (2016). Subliminal messages exert long-term effects on decision-making. Neuroscience of Consciousness, 2016(1). - Schmidt, K, L. & Cohn, j. F. (2001). Human Facial Expressions as Adaptations: Evolutionary Questions in Facial Expression Research. YEARBOOK OF PHYSICAL ANTHROPOLOGY, 44, 3-24. - Smith, M. L., Cottrel, G. W., Gosselin, F. & Sehyns, P. G. (2005). Transmitting and Decoding Facial Expressions. Psychological Science, 16(3), 184-189. - Strahan, E. J., Spencer, S. J. & Zanna, M. P. (2002). Subliminal priming and persuasion: Striking while the iron is hot. Journal of Experimental Social Psychology, 38(2002), 556-568. - Verwijmeren, T., Karremans, J. C., Bernritter, S, F., Stroebe, W. & Wigboldus, D. H. J. (2013). Warning: You are being primed! The effect of a warning on the impact of subliminal ads. Journal of Experimental Social Psychology, 49(2013), 1124-1129. - Whalen, P. J., Rauch, S. L., Etcoff, N. L., Mclnerney, S. C., Lee, M. B. & Jenike, M. A. (1998). Masked Presentations of Emotional Facial Expressions Modulate Amygdala Activity without Explicit Knowledge. Journal of Neuroscience, 18(1), 411-418. - Wiens, S. (2006). Subliminal emotion perception in brain imaging: findings, issues, and recommendations. Progress in Brain Research, 156, 105-121.